Johannesburg (South Africa) – On the 28th February EFC AFRICA’s newest welterweight champion, Michiel Opperman, received his EFC AFRICA champion’s ring from Pietro Cignolli, MD of Orpheo Twins Jewellers. As with each champion before him, and each to come, Opperman’s ring is 100% unique and will remain his regardless of how long he keeps his title. Each EFC AFRICA champion’s ring is made of yellow gold and fine silver, inside the champion’s name is inscribed and the date of his title victory inscribed behind. In addition each title defence earns the champion the addition of a white, brilliant cut, .05 carat diamond that is once again personally added to the ring with the additional title defence inscribed also. 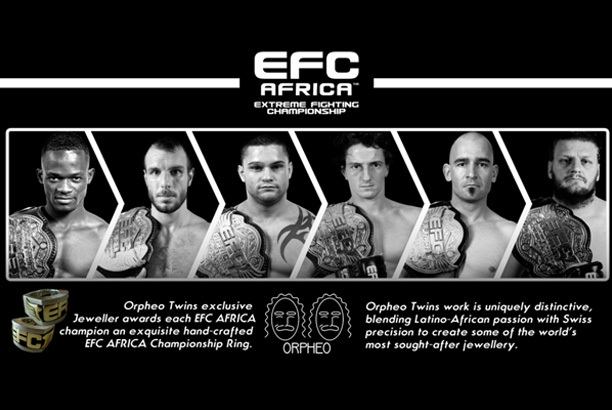 Orpheo Twins Jewellers have been providing EFC AFRICA champions with unique champion’s rings since the inception of the organisation. Former lightweight champion Wentzel Nel was the first ever to receive a ring, followed by the line of EFC AFRICA champions that have come after: Norman Wessels, Costa Ioannou, Adam Speechly, Dallas Jakobi, Garreth McLellan, Jeremy Smith, Jadyson Costa, Ruan Potts and Demarte Pena while recent champions JP Joubert and Andrew van Zyl are yet to receive theirs. At EFC AFRICA 19, to take place on the 19th of April, both the welterweight and featherweight titles are to be challenged. Should Nel defeat Pena at featherweight he will become the first EFC AFRICA athlete to hold a title in two weight classes, and the first to have two different title victories inscribed on his ring. Should Pena triumph another diamond added to his piece creating a record to match leading title defender Costa Ioannou.